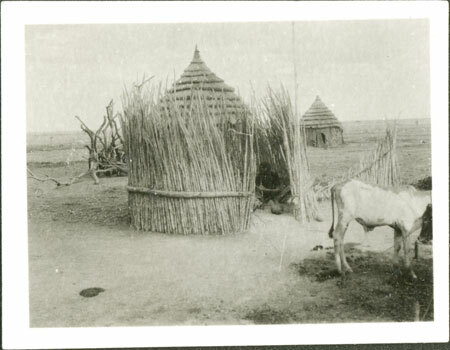 Looking into a windbreak (with a collapsed fence next to it) at a dry season camp (wec) with a cow tethered in front, and stake-walled huts visible beyond. Inside the windbreak is a youth, possibly holding a drinking straw or even a pipe. Note on print reverse ms pencil - "4 191 "
Morton, Chris. "Nuer windbreak at cattle camp" Southern Sudan Project (in development). 03 Jan. 2006. Pitt Rivers Museum. <http://southernsudan.prm.ox.ac.uk/details/1998.346.191.2/>.